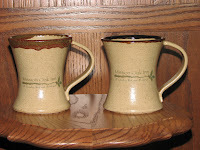 We now have our custom Mission Oak Inn coffee mugs, hand made by Ann Dittmer of Annie’s Little Pots in Princeton, IL. Each coffee mug is unique and is signed and dated by Ann. You can see more on Annie’s website www.annieslittlepots.com. This entry was posted in Uncategorized and tagged bed and breakfast, coffee mug, getaway, gifts, Mission Oak Inn, pottery by admin. Bookmark the permalink. Glad to see you joined the blogging world. You can’t go wrong with posting recipes!